As soon as we realised (on Twitter – naturally) that Polly had an evening free when she was coming back for her wedding five lovely bloggers decided to use this as the perfect reason to finally meet! It also happened that all of us had something in our lives to celebrate, so it was the perfect excuse (if food bloggers ever need one) to have some bubbles and go for sushi. Angie, as you might remember from her guest post for me is a huge sushi fan and suggested that that be the cuisine for the evening and well, we all jumped at the chance at trying a new restaurant. Enter, Oka, a small sushi restaurant in Kingly Court, Soho where none of us has ventured before. I’d recommend booking as even though we booked quite literally months in advance we could only get a table for 8.30pm. Now, what were we celebrating you ask? I took the opportunity to celebrate my graduation a little early, Polly is now a newlywed, Angie made Cision’s top 10 most influential lifestyle bloggers in London, Jaime has just bought her first home and Andrea’s going to Hong Kong on secondment next year! Going out for dinner with other bloggers is always slightly hilarious – there are cameras everywhere but at least everyone understands that you can’t touch the food without everyone having taken their photos! The menu is sharing style, which was perfect for a hot summer evening and for those of us who like to have a little taste of everything. First up was this delicious tuna tataki (seared tuna served with ponzu), which was one of my favourite dishes of the night. I loved the texture and how fresh the tuna was; it made a delicious start. I’m awful with chopsticks – as in really, really bad, so I’m sure the girls had a good giggle at my attempts to use them. Though, surprisingly, I did get better after a couple of glasses of prosecco; what can I say, it’s a magical drink! The first sushi rolls we had were the California prawn with avocado, cucumber and lime mayo which was good, but could have done with a little more flavour. Though in all honesty, put avocado on anything and I’ll eat it! But this was the dish that stole the show – salmon tartar. When you go out with Angie it’s a fair shout that there will be salmon on the table somewhere! In fact, it was so good that we ordered a second portion. The salmon was delicious, fresh and zingy. It comes “unprepared” to the table and not mixed – but being bloggers we had to take some snaps before our waitress mixed it! And then it was time to dig in – and boy oh boy, this dish was snapped up very quickly! We also ordered the sunomono salad with marinated fish and sesame dressing which as you can see wasn’t really a salad and was a little disappointing. With lots of food and drinks we were more than happy to while away our evening catching up, hearing all about Polly’s wedding, seeing snaps from Jaime’s wedding and hearing all about Angie and Andrea’s upcoming travels. It was really lovely to get to know these fabulous women and getting to know the women behind their blogs. Stating this blog has been wonderful for so many reasons, but high up the list of benefits for me is meeting some incredible people that I probably would never have met otherwise, and I count myself lucky to consider these four lovely ladies friends. But anyway, back to the food… The next sushi roll we had was the Dragon roll prawn tempura with asparagus, spicy mayo and avocado. It was much more exciting than the other sushi roll – I really love prawn tempura and this was fantastic. We ended up only ordering one actual main course, but as it was a sharing dish situation that was fine. For our main we opted for kimchi cicken with ginger, shallots and red vinegar which was really fantastic – I’d highly recommend ordering it. I can’t remember who suggested ordering this but boy dd they make a good choice! We had a little rice to share between us to go with the chicken. We couldn’t say no to a little dessert – especially as we had all already eyed up the cookie dough. Firstly, part of me didn’t expect it to be baked (is baked cookie dough not just a cookie?) and secondly, it was burnt. Hmmm. Not the perfect end to our meal. The other thing to note about Oka is that the restaurant closes at 10.30 so whilst we didn’t feel rushed we couldn’t stay for another drink after dinner. Polly, Angie and I decided to head down to Cahoots as it’s at the bottom of Kingly Court, for a final drink before saying goodbye – and I’m so glad we did! We all felt as though we had been transported back to the 1940s London – and felt like we were in the tube! There is an old tube carriage, the staff are dressed in the fashion of the day, right down to the red lipstick, and you order your drinks from a newspaper. And the cocktails are deeeeeeelicious! Excuse the poor photo, I was much more concerned with having a gossip at this point rather than concentrating on my photography skills! Oka was very reasonable for what we had, and in fact has been one of the cheapest meals I’ve had in London recently. 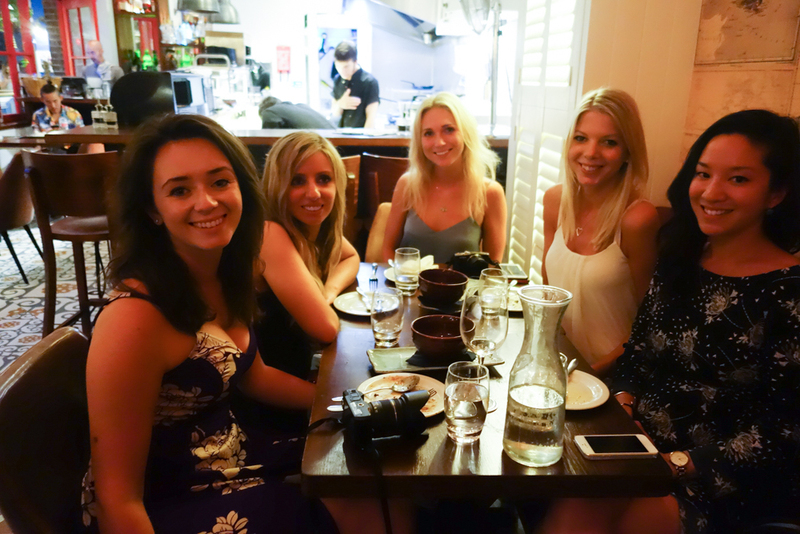 It was so lovely to finally meet these lovely ladies – and I’m sure it was just the first of many dinners to come!